Season 10 of the Hyundai A-League has been a challenging one for the Brisbane Roar, not just on the field, but particularly in its engagement with their fans. 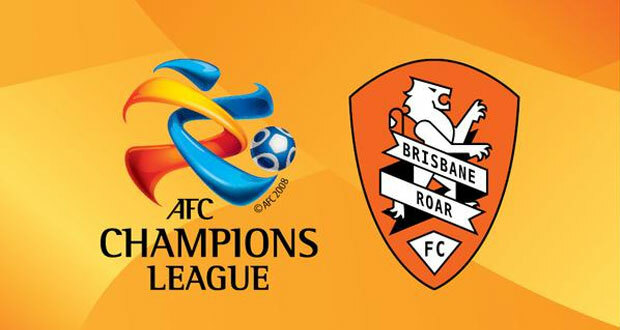 It had been known for some time that the Brisbane Roar’s opening Asian Champions League game would have to be moved from Suncorp Stadium because it clashed with a Foo Fighters stadium concert which had been booked before the ACL draw was confirmed. 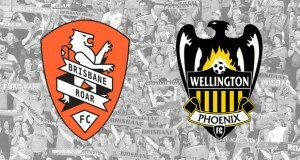 What was less pleasing to fans – and confirmed this week by the club – was that all of the Asian Champions League home games for the Brisbane Roar would be played on the Gold Coast. For those unfamiliar with South East Queensland, Skilled Park stadium in the Gold Coast is about an hour’s drive away from Brisbane CBD during off peak times. All of the Asian Champions League games take place on a week night and traffic between Gold Coast and Brisbane during peak hour in the evenings is pretty terrible. In essence, this decision makes it extremely difficult for Brisbane Roar’s Brisbane based fans (i.e most of them) to attend the games. The move also pretty much kills any chance of any decent away support making the trip for the game since Skilled Park has a tiny capacity and is difficult to get to. This is a huge shame when you consider the memorable support that FC Tokyo flew over for their game against the Roar three years ago. Worse still, the reason given for the games being held in the Gold Coast by the club don’t stand up to scrutiny. The club cited in its press release that it had to play all three games in the Gold Coast because of an AFC ruling that states that a club must play all their games in the same stadium. This is all well and good except Melbourne Victory played their ACL games at three different stadiums just last year. See, another clause states that clubs would be allowed to change venues if there were circumstances beyond their control that forced them to move stadiums (like a Foo Fighters concert for instance). In other words, the Roar’s attempt to deflect the reason for all the games being played in the Gold Coast onto the AFC didn’t make sense. The dishonest reasoning is made even worse in a season where the Roar sacked coach Mike Mulvey six games after wining a championship double and news of the sacking reached the press before anyone told Mulvey. The subsequent explanations about Mulvey straying from the club’s playing ‘philosophy’ didn’t really wash either as the Roar then spent the next six weeks playing route one football that looked nothing like the way they played in the last four seasons. Brisbane Roar has a passionate and loyal fan base and I can see club representatives doing their best to field questions and make explanations on social media. But they would be wise to simply adopt the old adage that honesty is the best policy. Trying to pin the decision on the AFC when Melbourne played 3 games at different venues last season was never going to fly. Three of the top four teams in the competition lost this week as the basement dwelling clubs in the competition finally got some much needed points. Its healthy for the league as the bottom four clubs have had very little to cheer about it and it made a lot of the fixtures terribly predictable. 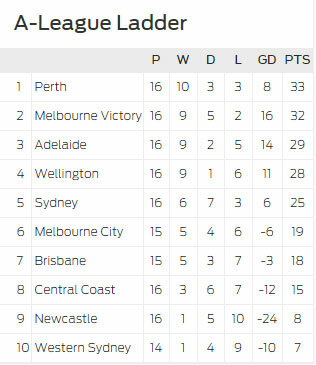 Now with Perth Glory’s lead at the top of the table reduced to a point, the stage is set for a terrific scramble in the coming weeks for finals berths. Western Sydney Wanderers finally picked up their first win of the season by playing very average football against a Wellington Phoenix team that showed much greater attacking flair. The RBB celebrated the win like they had won the Grand Final. The Roar made it back to back wins for the first time this season with a lousy performance at Hunter Stadium where they won the game thanks to an own goal from a Newcastle Jets substitute who came on the field in the 93rd minute and scored a goal four seconds after the whistle was blown.